After many dark years of zealous repression, there are now more than a dozen government-approved clinical studies with psychedelics taking place around the globe. But what does the future hold for psychedelic research and the expansion of consciousness? In this curated collection of interviews with pioneers in psychedelic thought, David Jay Brown explores the future of mind-altering drugs, hallucinogenic plants, and the evolution of human consciousness. 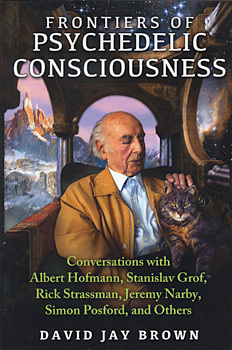 The accomplished scientists, artists, and thinkers interviewed in the book include LSD discoverer Albert Hofmann, psychologist Stanislav Grof, DMT researcher Rick Strassman, anthropologist Jeremy Narby, MAPS founder Rick Doblin, ethnobotanist Dennis McKenna, psychologist Charles Tart, and musician Simon Posford from Shpongle, as well as many others. Demonstrating deep knowledge of his interviewees' work, Brown elicits profound reflections from them as well as their considered opinions on the future of psychedelic drug medical research, God and the afterlife, LSD and mysticism, DMT research and non-human entity contact, problem--solving and psychedelics, ayahuasca and DNA, psilocybin and the religious experience, MDMA and PTSD, releasing the fear of death, the tryptamine dimension, the therapeutic potential of salvia, and the intersections between psychedelics and creativity, ecology, paranormal phenomena, and alternate realities. In each interview we discover how these influential minds were inspired by their use of entheogens. We see how psychedelics have the potential to help us survive as a species, not only by their therapeutic benefits but also by revealing our sacred connection to the biosphere and by prompting people to begin on the path of spiritual evolution. David Jay Brown holds a master's degree in psychobiology from New York University. A former neuroscience researcher at the University of Southern California, he has written for Wired, Discover, and Scientific American, and his news stories have appeared on the Huffington Post and CBS News. He is the author of more than a dozen books, including The New Science of Psychedelics. He lives in Ben Lomond, California.